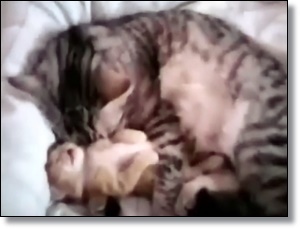 This is an adorable video of a sleeping kitten and its mother. Is the kitten having a bad dream...maybe a nightmare? To find out if feline science backs up that anthropomorphic explanation, we talked to Dr. Nicholas Dodman, director of the animal behavior clinic at Tufts Cummings School of Veterinary Medicine. Do you think that this kitten is dreaming or having a nightmare? Do kittens really have nightmares, or dreams at all? Well, the kitten’s clearly dreaming. It may not be a dream or a nightmare, it may be running after a mouse; we’ll never know. Some will say: You can’t prove cats dream. But if you measure brainwaves in cats, dogs and several other animals, it’s clear that they go through a period of rapid-eye movement, or REM sleep, when the brain is very active. In humans, exactly the same thing happens and that’s when we dream. I read a study that kittens do a lot of this kind of sleeping in their early life, as their brain is developing. And I believe it makes sense that REM sleep is not only associated with the maturation of neurons in the brain, but also with dreaming processes. As kittens begin to sense the world around them, those things can be regurgitated in sleep in the form of dreams. If it’s sleeping so deeply, why is it twitching its paws? Humans and cats both have certain muscles that are for precision, as well as what are called larger “anti-gravity muscles” like those that lift your legs. Those larger ones are activated by a neurochemical called serotonin. During REM sleep, the brain’s serotonin system is shut off, which means the anti-gravity muscles are shut off. What’s not switched off are these highly-tuned muscles in things like eyes and extremities what for us would be fingers and toes, but for them it’s paws and whiskers. This kitten is in the state of sleep some people call “the sleep of the body,” because the body is totally relaxed except for these tips of things twitching, while the brain is active and dreaming. The opposite is “sleep of the mind,” when the brainwaves go very big and slow, almost flattening out, but the muscles are not completely relaxed with a cat, that would be a catnap. And what does the mom’s reaction look like to you? Is she really “hugging” the kitten? Mommy is doing what mommy cats do. Like humans, they sort of fall in love with their babies. The hormone involved is oxytocin, it’s involved in all sorts of bonding, even between humans and their pets. So she’s cuddling up and keeping her baby close. She seems to be in slow-wave sleep, not REM, and the kitten’s movements seem to disturb her slightly. One limb happens to be under the kitten, and she puts her other paw across and feels the presence of her baby. To me it’s a perfectly natural example of maternal care and affection to a kitten who’s dreaming. You could refer to it as a hug. They’re mutually bonded and I think they enjoy the presence of each other. Human analogies are not entirely inaccurate. How old would you guess this kitten is, or how far along in its development? It looks pretty young, I’d say two to three weeks, though that’s just a guess. There are three main periods of growing up in a kitten. In the first two weeks, they’re basically just like little milk-sucking maggots; they can’t even open their eyes. In weeks two to seven, their eyes and ears open and they learn to socialize. And after that they’re called juveniles, becoming more independent. So we’re looking at a kitten that I think is in that second phase. The mother still needs to take great care of it because fear, the perception of danger, takes a while to develop. Humans and animals are born literally fearless, and need the parent to watch out for them or they might crawl right off the side of a bed, for example. So a kitten this young can’t stray far from its mother safely, and she keeps it close; draws it in often.